at MBO. Perched near the path along the B net line, it was nearly missed at first. 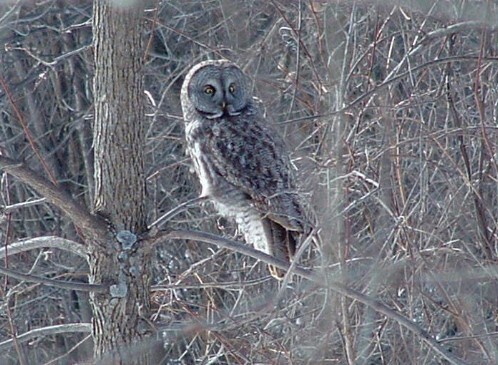 Notes: Without question, this week's highlight was the sighting on Saturday March 5 of MBO's first Great Gray Owl. It was perched fairly low down in one of the poplars along the "B" ridge, so well camouflaged that several observers walking down the path didn't discover the owl until almost below it. The owl showed no great interest in its human audience, and continued scanning the area for prey. Over the course of the morning it made a couple of short flights around the rear duck ponds, but most of the time could be seen in the distance as we went in and out of the banding cabin. The owl more than compensated for what was a quiet morning at the nets, largely the consequence of a gusty southwest wind that made the nets particularly conspicuous. All the same, we did band yet another Blue Jay, as well as a new American Tree Sparrow, and a couple each of Black-capped Chickadee and American Goldfinch, the latter already showing visibly more yellow and black in their plumage compared to earlier in the winter. Also another two returns today, a Black-capped Chickadee last recorded in October 2004, and an American Tree Sparrow not observed since the beginning of last December.